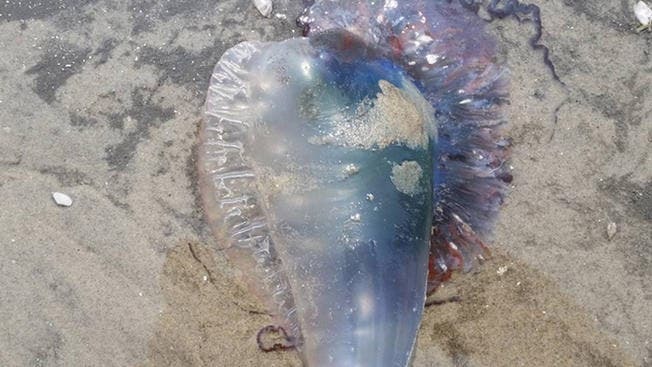 The media seems to panic a lot about the recent Portuguese Man of War sightings along the Jersey shore in the US, without providing much useful information about the situation or this creature. Here, we’ll take a look at the Man of War and see what you should do to stay safe on the beach. The first recent sighting, the one that started all the fuss, was on June 21 in Harvey Cedars on Long Beach Island, and now, another one has washed up at a Jersey Shore beach on Sunday, 5th of July. Is there reason to panic? No. Should you pay more attention when going to the beach? Yes, of course – you should always pay attention when going to the beach, and now there’s extra reason to keep your eyes open, especially if you’re usually barefoot. According to biologists, they are occasionally spotted, but never are they seen as frequently as they have been recently. The recent sightings are definitely unusual, and probably signify that more Man of Wars are in the area. Paul Bologna of Montclair State University pointed out that, “They are definitely lots of them around,” which he added isn’t something that is seen “every summer.” There will likely be more sightings in the next weeks. So why are they coming to this area? Well… they’re not. They are not “migrating” as some media outlets put it, because they can’t migrate – they can’t swim, and they’re at the mercy of oceanic currents. The northeast wind brings warm water from the Gulf Stream to shore, and along with it, seaweed and sea animals. carefully avoid any further contact with the tentacles and remove remnants of the organism from the skin – use something to pick them up, don’t touch them with your fingers or any other part of the body to avoid secondary stinging. apply salt water to the affected area. Careful, don’t use fresh water – it will only make it worse! follow up and apply hot water (45 °C or 113 °F) to the affected area from 15 to 20 minutes. If you don’t have any hot water, you can use regular water, but it won’t be as effective. if eyes have been affected, irrigate with copious amounts of room-temperature tap water for at least 15 minutes; this is one of the more dangerous areas to get stung in, so definitely seek medical assistance. don’t use vinegar! Vinegar might be recommended for some jellyfish injuries, but the Man of War is not a jellyfish (more on that later), and vinegar dousing increases toxin delivery and worsens symptoms of stings from the nematocysts of this species. Vinegar has also been confirmed to provoke hemorrhaging. Fatalities from such accidents are extremely rare, and generally, medical assistance is not required, but it doesn’t hurt to ask for it. Better to be safe than sorry! So what is the Portuguese Man of War? Underneath the widespread fear, it’s actually a fascinating creature. Despite its outward appearance, the Portuguese man o’ war is not a common jellyfish but a siphonophore – in other words, it’s not a singular organism, but rather a colony of specialized minute individuals called zooids. These zooids are attached to one another and physiologically integrated to the extent that they are incapable of independent survival. 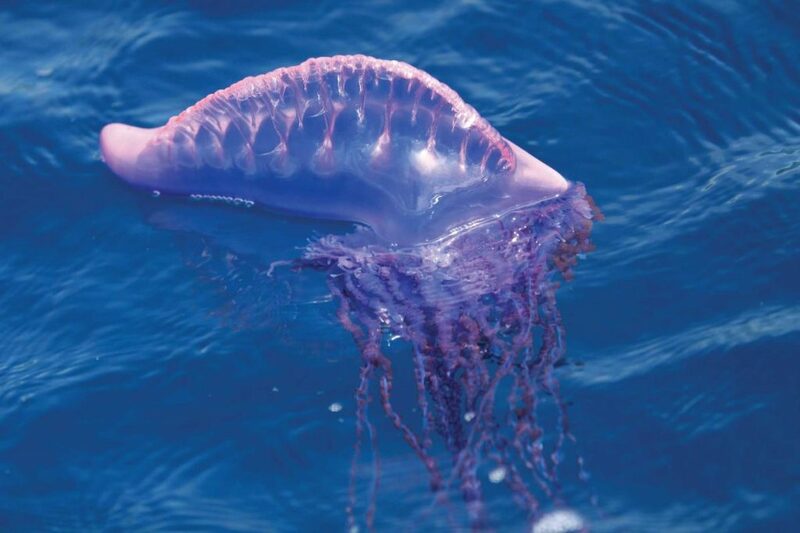 Its name comes from a resemblance with the man-of-war, an 18th-century armed sailing ship. The colony (now we know it’s not a singular creature) lives at the surface of the ocean. The gas-filled bladder remains at the surface and ensures flotation, while the remainder is submerged. They have no way to swim around, so they are at the mercy of currents and wind. The reason why the venomous tentacles exist in the first place is that the colony is a predator which traps and paralyzes its prey. It typically feeds on small marine organisms, such as fish and plankton. However, some creatures are immune to its sting. Most notably, the blanket octopus is not only immune to the Portuguese Man of War, but it eats them and then steals its tentacles, which it uses as weapons to hunt other creatures. Yikes!